Fortunately for us, the Derbyshire records called the Domestic State Papers were published in the Derbyshire Archaeological Journal Vol. I in 1879. West Hallam Two Alehouses William Johnson and Gabriell Holly. The list was submitted 15th November 1577. 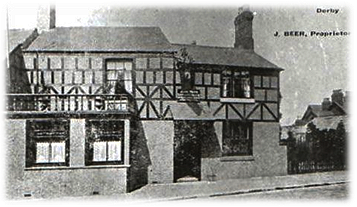 The exact location of these hostelries is not known but they were probably situated at a farmhouse. Brewing providing the farmer with a second income. 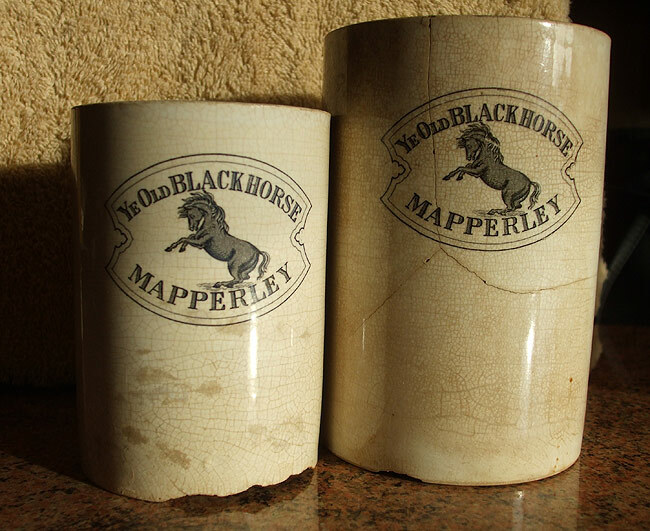 To appreciate the size of Mapperley in these early times we can use the Hearth Tax returns for the village. 2 houses had 2 hearths one occupied by Mr Houlden and the second Mr Dickenson. Richard and John each having a house with a single hearth. Hearth tax or Chimney tax was granted to Charles II in an Act of 1662. Raising revenue for the King. Paid in two equal instalments at Ladyday (25th March) and Michaelmas (29th September). Payment was to be made by the occupier of the premises, or if vacant by the owner. Charged at one shilling per hearth for each six-month period. This unpopular tax was withdrawn in 1689. Being replaced by the Window tax. The only public house in Mapperley. 1864 Richard Attenborough (Landlord) with William Hardy retained as Malster). 1876 William Bentley (Landlord and Malster). 1895 Samuel Harvey at this time the Harvey family were landlords of Black Horse and the Royal Oak. 1904 - 1925 John Beer. Our first record for the premises are when we find them to Let in the Derby Mercury dated September 25th 1822. To be let and entered upon at Michaelmas next (29th September). A commodius dwelling house with garden, stable, outbuildings. Comprising a house place, parlour, kitchen and back kitchens and five lodging rooms over the same. Also a very convient malt office adjoining the said dwelling house. In a complete working state, capable of steeping and drying eight quarters of malt every five days. Which is situated within half a mile of the Nutbrook Canal. The above premises were lately in the occupation of the late Thomas Abbott, and his under-tenants. The offer to let was not taken up. So the property was advertised for sale on 20th January 1823. It is at this time when the pub became a Coaching Inn. Mainly providing rooms for visitors to Shipley Hall, requiring overnight stays. The pub, being the nearest hostelry to the Hall. For many years a stepping stone stood outside the premises. Allowing customers easy entry into their carriage. The route to the hall was very different from today. The main road being of the Lane, over the Brook, onto Bell Lane and onto the Hall. The remains of the old bridge can still be seen today at the west end of Mapperley Reservoir. In the Derby Mercury an advert appears October 18 1865 we again find the Black Horse for sale. For sale on Monday 6th November. Lot 1 A set of Malt rooms complete with kiln, cistern, graneries, cart shed and other conviences capable of steeping 12 quarters of grain. (In the occupation of William Hardy). Lot 2 A dwelling house situated near to lot 1 in the occupation of Mrs Hardy. Comprising two parlours, house place, a kitchen, five bed-rooms, large cellar, brew-house and large garden. Lot 3 All that dwelling-house or tenement adjoining lot 2 with garden in the occupation of William Cook. Lot 4 Dwelling or tenement fronting Town Street now in the occupation of John Hawley, together with stable and hayloft. Our final sale on March 3 1897. It is interesting because in attendance was many of the local brewery companies. The pub was sold with four adjoining cottages. The Ilkeston Brewery Company purchasing the property for £3,100. John Beer landlord from 1904 - 1925. It was John who had a generator installed bringing electricity to the village before it was installed at Ilkeston. He was highly regarded for his gardening skills especially showing fine displays of ferns, orchids and exotic flowers. Squire Mundy was a frequent visitor. John Beer's grave can be seen in Mapperley churchyard. Martha Noon of Ilkeston was charged by William Bentley of the Black Horse with stealing a box of figs and 1s-2d from his dwelling house. She had been in service for just seven weeks. On Boxing Day he received a Christmas Gift of a box of figs from Mr Merry of Ilkeston. Some of the figs were missing on Friday the 27th and again on Sunday 29th. He accused her on the latter day with stealing the figs. She denied the charge. But then told the charwoman that she was not only guilty, but had also stolen 2s-2d. In answer to the charge the prisoner who was said to be nearly 17 years of age was sent to prison for 21 days. The bench taking into consideration that she had been in the lock-up for a week.